I've been reading Alex Ross in The New Yorker for ages. And his blog, while he's been writing the book. So I was very excited when this finally arrived from Amazon. And it's brilliant. Funny, erudite, readable. I've dabbled with 20th century music before but this really made me want to dive in. And it's not just the writing about music, it's the cultural history that gets told around it. Fantastic stuff. I dog-eared far more pages than I could transcribe here, so these are the ones that might be interesting to you beyond the world of music. "Strange regions there are, strange minds, strange realms of the spirit, lofty and spare. At the edge of large cities, where street lamps are scarce and policeman walk by twos, are houses where you mount til you can mount no further, up and up into attics under the roof, where pale young geniuses, criminals of the dream, sit with folded arms and brood; up into cheap studios with symbolic decorations, where solitary and rebellious artists, inwardly consumed, hungry and proud, wrestle in a fog of cigarette smoke with devastatingly ultimate ideals. Here is the end: ice, chastity, null. Here is valid no compromise, no concession, no half-way, no consideration of values. Here the air is so rarefied that the mirages of life no longer exist. Here reign defiance and iron consistency, the ego supreme amid despair; here freedom, madness and death hold sway." The conductor Reinbert de Leeuw has written: “Satie was, in a manner of speaking, starting European musical history all over again.” The same could have been said of Debussy, who in 1901, remarked to his colleague Paul Dukas that too many modern works had become needlessly complex – ‘They smell of the lamp, not of the sun.” Debussy was describing the motivation for his latest work, the Nocturnes for orchestra, and in particular for the movement “Fetes”…This was the germ of an alternative modernism, one that would reach maturity in the stripped-down, folk-based, jazz-happy, machine-driven music of the twenties. In essence, two avant-gardes were forming side by side. The Parisians were moving into the brightly lit world of daily life. The Viennese went in the opposite direction, illuminating the terrible depths with their holy torches. Another of those eternal divisions. My version of this was to fall in love with Haircut 100 and completely not see the point of Joy Division. The impulse to go the brink of nothingness is central to Webern’s aesthetic: if the listener is paying insufficient attention, the shorter movements of his works may pass unnoticed. The joke went around that Webern had introduced the marking pensato: Don’t play the note, only think it. Iain's recently reminded me of those early Pole albums. They feel a bit this way. It'd be interesting to imagine what a website with this kind of aesthetic would be like. How evocative is that? Brilliant. The list may be the least exploited but most potent literary form. That's a good project; a list of all the great literary lists. When the Fourth Symphony had its first performance, in April 1911, Finnish audiences were taken aback. “People avoided our eyes, shook their heads,” Aino Sibelius recalled. “Their smiles were embarrassed furtive or ironic. Not many people came backstage to the artists’s room to pay their respects.” This was a Skandalkonzert in Scandinavian style, a riot of silence. That's just to entertain the Finns out there. Anyone who's worked with Nokia will understand a riot of silence. “Everything begins in mystique and ends in politics,” wrote the French poet Charles Peguy in 1910. Morton Feldman, the maverick modernist who loved Sibelius, applied this epigram to twentieth-century music, describing how grandiose ideas are made ordinary with the passage of time and become fodder for a power struggle among ideologues and pedants. Again, both of these are about more than music aren't they? They explain a lot of stuff. But perhaps the most interesting part of reading The Rest Is Noise is the way it made me think about books, and how books could be better. Almost every page had me wanting to listen to something; putting the book down and scrabbling for emusic or iTunes. 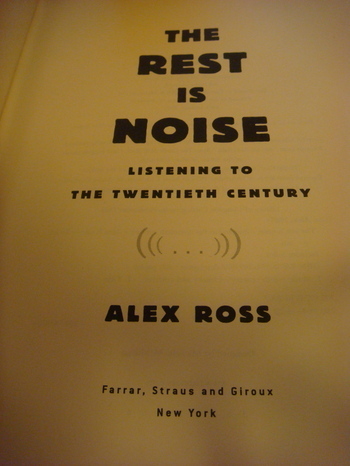 Mr Ross uses links on his blogs splendidly to illustrate the book, but I kept wanting to listen while I was reading. Not be switching from one medium to another. This might have solved the problem. And all this googling also reminded me of the wealth of performances on YouTube; it's an extraordinary place to explore classical and avant-garde music. So I've been working on a little vodpod collection of things I've found while pursuing the music of The Rest Is Noise. It takes in Glenn Gould playing Webern, some extraordinary Debussy on Russian folk instruments, some Ligeti with a visual score, Steve Reich on the South Bank Show and, of course, the Helicopter Quartet, which you have to look at. Isn't this a fantastic possibility for something like Amazon's kindle thing? Not too complex, very portable but lots of potential to deliver just this sort of limited multimedia / book hybrid.